In this presentation, Dr J Simon Rofe explores the framework of “global diplomacy” that has emerged in the world of international sport, how it is operationalised through various forms of communication, representation, and negotiation, utilising models of analysis drawn from the mainstream of the academic political science literature as it has been applied to the field of global diplomacy. He develops the proposition that sport is increasingly used as a tool of diplomatic practice, but also is itself a cause of diplomatic transaction, and that has significant implications for the way in which sport organisations operate in the international realm. The range of actors, or “players”, involved in the transactions of diplomacy occasioned by sport are manifold. In the case of the world’s “global game” – association football – they include but are not limited to individual footballers, football clubs, national leagues, national associations, football’s international governance structures, multi-national sponsors, and numerous hangers on. Importantly for this analysis, such a panoply of actors creates an architecture, replicated across other sports, which speak to the necessity of furthering the understanding of the relationship between sport and diplomacy. These two phenomena share a long-standing similarity in global affairs; both having been over-looked as means of comprehending relations between different polities otherwise centred on the nation-state. J Simon Rofe is Senior Lecturer in Diplomacy and International Studies in the Centre for International Studies and Diplomacy at SOAS, University of London. He is Programme Director of CISD’s MA in Global Diplomacy, and co-instructor of the award winning ULIA MOOC ‘Understanding Research Methods’, sole instructor of the new MOOC ‘Global Diplomacy: Diplomacy in the Modern World’. His research interests focus on US Foreign Relations in the twentieth century with a specific focus on the diplomacy of sport and the pedagogy of online learning. Author of numerous books and articles including The Embassy in Grosvenor Square – American Ambassadors to the United Kingdom 1938-2008, with Alison Holmes (Palgrave: Basingstoke, 2012). Simon is also co-series editor of Key Studies in Diplomacy (MUP) and is on the editorial board of Diplomatic History. 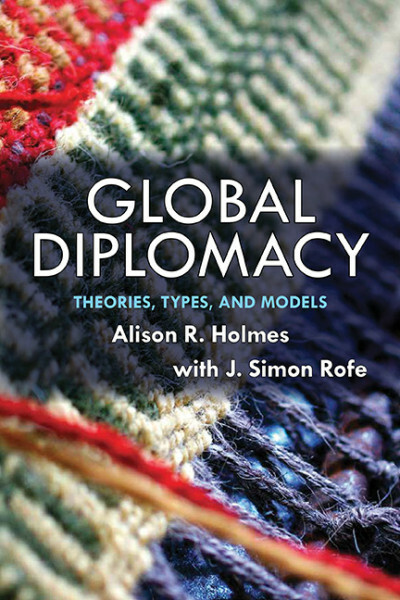 Holmes, Alison R. and Rofe, J. Simon (2016) Global Diplomacy: Theories, Types and Models.Colorado: Westview. Rofe, J. Simon (2016) ‘Prologue: Diplomacy and Sport.’Diplomacy and Statecraft, 27 (2). pp. 207-211. Rofe, J. Simon (2016) ‘Sport and Diplomacy: A Global Diplomacy Framework.’Diplomacy and Statecraft, 27 (2). pp. 212-230. Rofe, J. Simon (2016) ‘”Strenuous Competition on the field of play, Diplomacy off it” – The 1908 London Olympics, Theodore Roosevelt, Arthur Balfour, and Transatlantic Relations.’Journal of the Gilded Age and Progressive Era, 15 (1). pp. 60-79. Rofe, J. Simon (2014) ‘It is a squad game: Manchester United as a diplomatic non-state actor in international affairs.’Sport in Society, 17 (9). pp. 1136-1154.